There Is Also A Detached Garage At This Property. 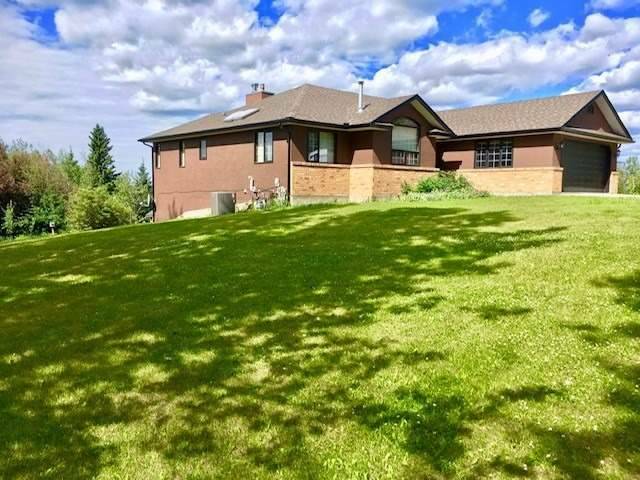 Just 8 minutes from town a beautiful 4 bedroom executive home on an amazing 40 acres just minutes from town all on paved highway. 4 Bedrooms and 1 office with laundry on main floor. Walk-out basement with infloor heat which includes 1 bedroom, office, family room, and rec room with wet bar. Attached double garage (22x22) and a detached heated double garage (30x24) to store all your toys. Landscaped yard includes a large deck with mountain views, 10x20 dog run, gazebo, 2 sheds, hot tub, and a fire pit area perfect for entertaining. Updated shingles, eavestroughs, fascia, counter tops, appliances, A/C, vinyl plank flooring, carpet, and light fixtures. School bus drives right up to the house for pick up and drop off. Don't miss this rare opportunity. A local farmer cuts the hay yearly and provides a cheque of approximately $600 each year (depending on the price of hay). This can be cancelled at anytime if you need the hay for your own livestock. Perfect to help pay property taxes! Please contact Chris at 780-712-1887.